Black Stainless Steel is the new Black and Alexi Politis from Seeking Alexi is giving us her professional tips on how to create a fresh new look in your kitchen with the help of GE’s new finishes. 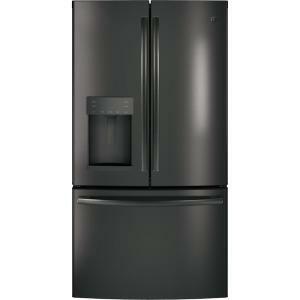 Read more about styling GE black stainless steel kitchen appliances below! Alexi here! Last time I wrote it was about Master Bathroom Update and it was so epic if you missed it! First off, you will not believe what a difference new appliances make for a kitchen. And with some additional small updates, you can have yourself an entire new kitchen in no time. I know, look at that kitchen! I can hardly believe it belongs to me! But even more than that, is that these GE Adora black stainless steel appliances had an even more dramatic effect on my kitchen when you see the before photo from 2 years ago on my blog. If you go take a peek, come right back here to read the review of these appliances! Do they scratch? Do they show fingerprints? Are they actually black? I’ll answer all of these and more below. First thing’s first, I was confident I would love my stainless steel appliances, but I love them even more than I thought I would. Why? Let’s go through the appliances one at a time. Wow. That’s all I really need to say. 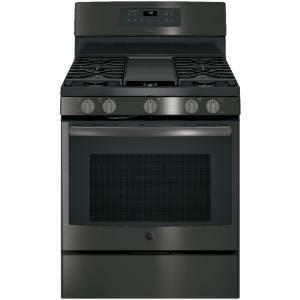 I am obsessed with this GE Adora gas range! I do a lot of quick cooking at my stove often for dinnertime, and this gas flame heats food up super quick! On top of that, it has the industry’s largest non-stick griddle embedded in the middle and I love it so much! It’s perfect for pancakes or eggs, and you can just lift it off to remove it for cleaning. I also researched that you can fit up to six grilled cheeses on it at a time; I will definitely have to try that! The last thing I should mention is that it’s very durable and high-quality. I can tell that from just a couple weeks of use that it’s holding up stronger than my past ranges have. The microwave is everything you need. It’s energy-efficient, extremely spacious, and it looks beautiful, too. 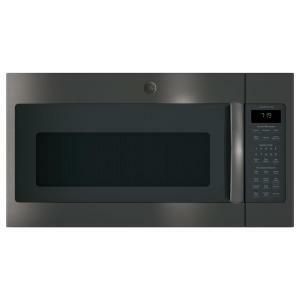 Mine is installed directly above my range, which creates a beautiful focal point of sleek black stainless steel. It is technically taking up the same size as my last appliance, but somehow it feels massive. I know it’s not bigger from the outside, but it is definitely more spacious on the inside. There is also a third drawer to clean things like knives, chopsticks, and spatulas, so that might help increase the feeling of more space, as well. Last thing I’ll say, is that the dishwasher has been run several times already, but it still looks brand new like it’s never been used, not even a water spot! My favorite appliance of the whole room, my new Adora fridge! I was really disliking my old fridge, it was extremely cramped, and it had so many areas that were a waste of space. Again, this fridge is so spacious! I swear it’s so massive that it fits at least twice as much. The drawers are gigantic, which I love, the shelves are all adjustable, to accommodate your organization preferences. And my favorite part of all the appliances is this….AUTOFILL! The fridge has a feature to automatically fill your cup or glass with water! You just put the container under the spout, tap the autofill button, then you can walk away and it will stop at the perfect spot! Still have questions? These should answer them! No, they are not straight black-colored. They are more of a very dark charcoal with varying materials and stunning grain. This dimension makes it easier to match other metals and other black items in your kitchen. Next, since they are metal, they are not scratch-proof. I have one minuscule scratch on the bottom lower corner of my fridge…but I nicked it with a razor blade when I was trying to clean something, so that’s my fault. But other than that, I have zero scratches on any of my four new appliances! The quick answer is yes, but not as much. Most likely you’re used to typical stainless steel which shows every single smudge/fingerprint and they’re very hard to clean off! Since these Adora appliances are still stainless steel, it is not technically smudge-proof. However, it shows dramatically less fingerprint smudges than the normal stainless steel. They are engineered to be cleaned with just warm water and a microfiber cloth. That’s easy! Just make sure you rub with the grain and not against it. In conclusion, overall, these appliances are absolutely killer and I recommend them! If you are on the fence about replacing your appliances, check out my YouTube video here that explains why you should bite the bullet and do it, already! If you’re one of the brave ones who is ready to take the plunge already to update your appliances, I highly recommend my video on the 3 essential styling tips when you do so! In addition to replacing your appliances, you also have to do a few other things, so make sure you check that video out! Lastly, if you want to see the behind the scenes of this kitchen update, head over to my Instagram where you can also ask me your unanswered questions while you’re there! Thanks again, The Home Depot! 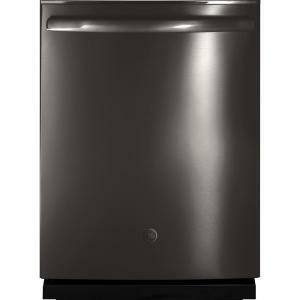 Learn more about styling GE black stainless steel kitchen appliances at The Home Depot.